Photo credit: Biju Boro/AFP. 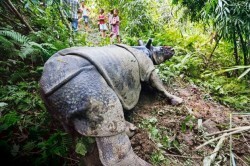 At least 39 one-horned rhinos have been killed in the Kaziranga National Park in the last 10 months. The rhino was found lying on its side, bleeding profusely from a bullet wound, and a stump where its horn used to be. 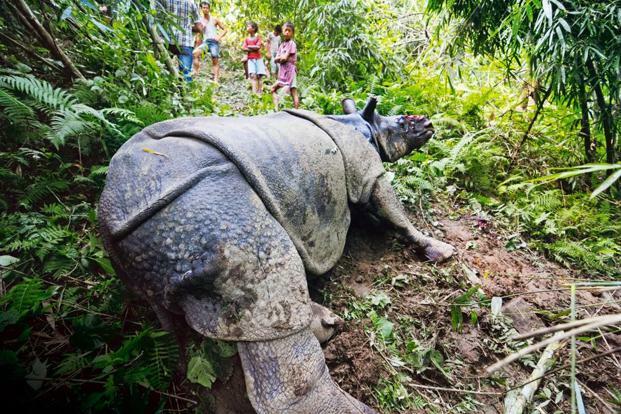 The guards of the Kaziranga National Park, Assam, had lost track of the animal during the floods that had submerged most of the nature reserve after September’s heavy monsoon rains. Before the waters had receded, poachers had butchered four more. A lush expanse of tropical forests, swamp lands and waving fields of elephant grass nestled in the heart of Assam, Kaziranga is a Unesco World Heritage site, boasting two-thirds of the world’s endangered one-horned rhino population, and among the highest density of tigers in the world. Herds of elephants, water buffalo and swamp deer meander waithin the park boundaries—the inspiration for poets, writers and film-makers. Today, that natural bounty is under attack: In the past 10 months alone, the park has lost 39 rhinos to poachers and flooding, according to reports by PTI—an alarming number, given that there are fewer than 3,000 left in the world. Nor is Kaziranga the only wildlife preserve in India facing mounting troubles. According to statistics from the Wildlife Protection Society of India, 2012 has been one of the deadliest years for tigers in recent history, with 28 tigers killed by poachers so far—more than twice the number killed in 2011. Varieties of endangered owls (sacrificed in religious ceremonies) and spotted leopards are also disappearing rapidly from other parts of the country, under the noses of the authorities. First passed in 1972, the Wild Life (Protection) Act is the primary legislation protecting the country’s unique flora and fauna. The Act established schedules of protected animals and plants, outlawed hunting and harvesting of species, and set up a notification process for new wildlife preservation areas. Today, India has a total of 668 protected areas, including 102 national parks, 515 wildlife sanctuaries, 47 conservation reserves and four community reserves—covering nearly 5% of the country. However, the issues of prosecuting poachers, humans encroaching upon animal habitat and the loss of animal life through traffic accidents—particularly to vehicle and train collisions—remain critical challenges. There have been several attempts to amend the Act in order to better protect wildlife. Of principal concern is the trade in illegal wildlife products—a multi-billion-dollar industry fuelled by growing demand for rhinoceros horns and tiger parts in countries such as China and Vietnam. In October, the cabinet approved several amendments to the Wild Life (Protection) Act which are slated to be discussed in Parliament in the forthcoming winter session. These would incorporate certain provisions of the Convention on International Trade in Endangered Species of Wild Fauna and Flora (Cites) and increase penalties for offences such as poaching. Cites is an international agreement between governments that aims to ensure that international trade in specimens of wild animals and plants does not threaten their survival. Another amendment attempts to stem the tide of animal-people conflict, by making it mandatory to consult gram or village panchayats before new wildlife areas are notified—an amendment not all wildlife experts are happy about. Advocates of this amendment argue it is the only way to deal fairly with indigenous forest dwellers, who have sometimes been thrown out of the forests, their traditional homes, without prior consultation once the land has been designated a national forest area, causing an outcry among human rights activists. However, critics worry that consulting locals could make the already lengthy process of notifying new wildlife areas even more difficult. Even more worrying than poaching for Prerna Bindra, a Delhi-based senior conservation consultant with Wildlife Conservation Society-India, Bangalore, is the issue of wildlife corridors for large animals such as elephants and tigers. In 2010, seven elephants were hit by a speeding cargo train in West Bengal after two baby elephants got stuck on the tracks. Upon hearing the train approach, five adults lined up in front of them on the tracks, using their bodies to protect the babies. All seven were killed. Similar deaths have been reported in Orissa, Assam and Karnataka. Such incidents could be minimized with a new amendment in the wildlife law to protect corridors. Bindra, a non-official member of the National Board for Wildlife (NBWL), believes that it is vital to protect critical wildlife corridors by making it mandatory for large infrastructure projects that cut across well-known wild animal passages—such as the construction of a new highway, train line or power plant—to go through the scrutiny of the NBWL, an apex statutory body headed by the Prime Minister that advises the Central government on wildlife policy, conservation and management. Currently, there is no official data on the number of wildlife lives lost due to road or train accident—though there have been many incidents. When the NBWL met in September, the Union minister of state for environment and forests, Jayanthi Natarajan, assured that the Act would be amended to legally protect elephant reserves and wildlife corridors. However, there has been little follow-up since. The amendments would identify and notarize protected wildlife corridors and require any large development projects around them to go through the scrutiny of the board. Cutting to the heart of India’s conservation challenge is a difficult quandary: How does a country of 1.2 billion people, one-third of the world’s poor, and roughly 7% of the world’s wildlife (including more than 100 varieties of endangered species) manage rapid development without irreparably damaging the delicate environment and ecosystem? “Unfortunately, it’s a question that has no easy answer,” says Bhargav. The Wild Life (Protection) Act, 1972 is the primary piece of legislation protecting the country’s animal and plant life. Currently, India is home to 7% of the world’s wildlife—including 461 endangered plants and animals, of which 133 are listed as “critically endangered” in the International Union for Conservation of Nature’s (IUCN’s) Red list 2012. These include the Bengal tiger, Malabar civet, Indian black vulture, forest owlet and green eyed bushfrog. There are two primary amendments that were approved by the cabinet in early October. These would amend the current Act to incorporate provisions of the Convention of International Trade in Endangered Species of Wild Fauna and Flora (Cites) and enhance penalties for offences such as poaching. They would also make it mandatory to consult ‘gram panchayats’ before new wildlife areas can be notified. They are going to be introduced in Parliament in the forthcoming winter session. Neither set of amendments deals with the issue of protecting critical wildlife corridors—where human-animal conflict (such as traffic collisions) has led to hundreds of animal deaths over the years. Implementation is also an issue: Many of the officers don’t have adequate training in the law or are not sensitized to the seriousness of wildlife crime. Conviction rates for poachers and trafficking are quite low. Critics worry that an amendment which would make it mandatory to consult ‘gram panchayats’ prior to the notification of new wildlife areas could dilute the current Act. A non-profit organization that works in partnership with local communities and governments to conserve nature—particularly endangered species and threatened habitats. Also works in animal rescue. A conservation organization that works in collaboration with the government to secure the over 4% of India legally reserved for wildlife in the form of sanctuaries and national parks. Also works with local communities to ensure they find a better quality of life outside protected areas through implementation of voluntary resettlement programmes. People with specialized skills, including lawyers, journalists and researchers, required for wildlife conservation.